Foursquare has made a change to its business with the hopes of being a larger player in local search and competing with Google and Yelp. Foursquare is transitioning to a new age and has rebranded themselves and created a spinoff app. So what are these changes and what should you be aware of as a business owner? Foursquare app was once upon a time one of the cool new apps that combined social networking and gamification by allowing users to check-in and win badges. Were you once the Major of the Year? 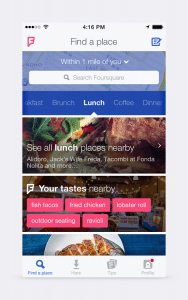 Foursquare has recently announced that they are spinning off their app into two. You will no longer be able to check-in on the Foursquare app as it has become more Yelp-like as a local discovery tool while they have allowed check-ins and more of a social aspect on Swarm–it’s new app. Local is huge. Over the past few years there has been a big push to provide discovery tools for people to find their local mom and pop businesses. This push is evident in the two front-runners–Google and Yelp. So as a business owner, you should make sure that you have claimed your local directory listings so that you can be found online. From an SEO standpoint this is very important and it is also important to get reviews on your local websites so that your site builds credibility. Be active on Swarm. Not Foursqure Download Swarm and connect with your friends so that you can continue to check in as you did with Foursquare. The essence of Swarm is what made Foursquare unique. Whether it is successful after rebranding is another story, but if you want to have the social aspect you have to use Swarm and not Foursquare. The jury is still out on the changes (as the reviews show below) but if you want to interact as you did with Foursquare, you will have to download Swarm. Change is inevitable. While change is something that is hard to precisely pin down, you can expect that the only consistent thing is that change will always occur. Look at it as an opportunity for your business. If you are aware of these changes or have someone you work with that is aware of these changes, you will always be able to take advantage of the opportunities. It’s not just Foursquare/Swarm, it’s happening a Google and Yelp as well. If you need help navigating these changes or any others, contact us for a free consultation at Blue 16 Media.